Hypertension due to arterial compression of rostral ventrolateral medulla (VLM) is well known, and microvascular decompression (MVD) surgery has a beneficial role in this subset of patients. It is postulated that compression of pressor center in the rostral VLM causes overstimulation of sympathetic nervous system manifesting as hypertension. Posterior fossa tumors also can compress VLM and manifest as neurogenic hypertension, which usually improves after tumor resection and medullary decompression, although evidence in this regard is scanty. We describe two pediatric patients who underwent medulloblastoma excision and developed new onset hypertension postoperatively requiring multiple antihypertensives. Imaging revealed leptomeningeal spread of tumor involving VLM in both patients. Both of them ultimately succumbed to death. To our knowledge, new onset, persistent refractory hypertension after medulloblastoma excision has not been reported so far. In this report, we discuss the causes and prognostic significance of such persistent hypertension in these patients. A 4-year-old male child, who had undergone ventriculoperitoneal (VP) shunt surgery and medulloblastoma excision 3 months back, came to the emergency department with complaints of fever, headache, drowsiness, and painful neck movements of 5 days duration. He was diagnosed with bacterial meningitis and was treated with intravenous antibiotics. VP shunt was later revised. 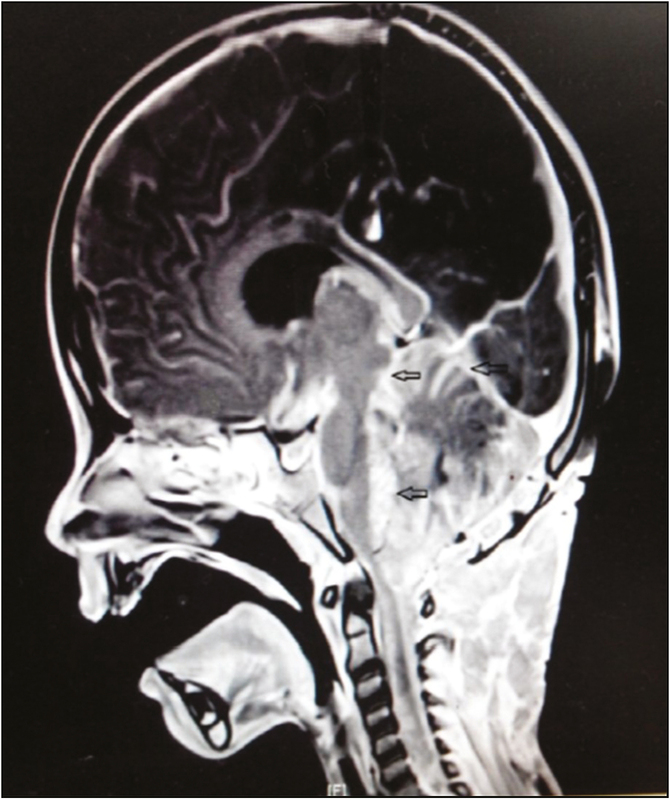 Postoperatively, patient became drowsy requiring intubation and mechanical ventilation. Further stay in the neurosurgical intensive care unit (NICU) was complicated by multiple episodes of generalized tonic clonic seizures (GTCS); tracheostomy was performed due to poor neurological status. He subsequently developed high blood pressure (systolic blood pressure of 150–180mm Hg and diastolic blood pressure of 95–110mm Hg) and tachycardia. Intravenous labetalol and sodium nitroprusside infusion were used for blood pressure control. Magnetic resonance imaging (MRI) of head and the spine revealed metastatic leptomeningeal spread of tumor involving lateral pons, medulla, and upper cervical spine [Figure 1]. The patient continued to deteriorate and died 6 days later. A 2-year-old male child was posted for midline suboccipital craniotomy and medulloblastoma excision. He had undergone VP shunt surgery 15 days back. Preoperative vitals were within normal limits. Preoperative MRI of the brain showed tumor causing indentation of posterior aspect of medulla [Figure 2]A]. After an uneventful surgery, the child was extubated in the operating room. Within minutes, he developed severe stridor requiring reintubation. Elective mechanical ventilation under sedation was planned and he was shifted to NICU. Postoperative computed tomographic (CT) scan was normal. In the NICU, high blood pressure (systolic blood pressure of 140–160mm Hg and diastolic blood pressure of 90–110mm Hg) and tachycardia developed in immediate postoperative period. This hypertension was thought to be due to brain stem manipulation and edema, and was initially not treated due to concerns of reduction in cerebral perfusion pressure. But hypertension continued to persist during stay in NICU, and treatment with intravenous labetalol infusion was later started to control persistent hypertension. The child was extubated on fourth postoperative day and shifted to ward on oral labetalol. Enalapril was added later for blood pressure control. Repeat postoperative MRI showed leptomeningeal metastatic spread of tumor involving VLM [[Figure 2]B], supratentorial compartment, and entire spinal cord [[Figure 2]C]. The results of pheochromocytoma workup were found to be negative. Further hospital stay was complicated with hyponatremia, GTCS, neurological deterioration requiring reintubation, and later tracheostomy. The child ultimately died 1.5 month after surgery. Medulloblastomas are embryonic tumors originating from primitive neuroectodermal progenitors involved in the development of cerebellum and brain stem. They are the most common malignant solid tumors of central nervous system in children],[ accounting for about 20% of all childhood brain tumors. One-third of these patients are incurable and die within 5 years of diagnosis; those who survive have a poor quality of life. They are contemporarily treated by tumor resection followed by chemotherapy. However, response to therapy and survival are markedly variable. In 1970, Cameron and Doig reported two cases of cerebellar tumors with brain stem compression causing malignant hypertension. It was one of the first reports relating posterior fossa tumors and systemic hypertension. Some authors speculate that presence, rather than extent of compression, is more important in the pathogenesis of posterior fossa–related hypertension. Such hypertension is reported more commonly in adults, despite the fact that posterior fossa tumors are more prevalent in children. In any case, this hypertension usually resolves after removal of medullary compression. Apart from direct medullary compression by posterior fossa tumors, posterior fossa crowding, raised intracranial pressure, and tumors containing vasoactive neuropeptides can also cause systemic hypertension.,Concerns raised by such hypertension include deranged cerebral autoregulation, possibility of cerebral hyperemia and consequent raised ICP, hypertensive encephalopathy, etc. Moreover, studies by Jannetta et al., Geiger et al., and Sindou et al. have implicated rostral VLM and root entry zone (REZ) of IX–X cranial nerves as the sites of neurogenic hypertension.,, A significant benefit was observed by concomitant MVD of nerve V along with IX–X and VLM in patients with trigeminal neuralgia. In our patients, postoperative CT scans were normal in both the cases, thus ruling out the possibilities of brain stem compression, ischemia, or hematoma. Brain stem edema due to intraoperative manipulations could be responsible for immediate postoperative hypertension in the second patient, reason why it was not treated initially. But, such hypertension usually resolves as edema subsides over 36–48h. In literature, there is a single case report of new onset hypertension in immediate postoperative period after removal of medulloblastoma, which resolved over 24–36h and was attributed to probable postoperative brain stem edema by the authors. Leptomeningeal metastases are common manifestations of solid tumors and are diagnosed based on MRI and cerebrospinal fluid (CSF) analyses. Without specific treatment, median survival in these patients is limited to 4–6 weeks and 2–3 months with treatment. MRI of head and the spine in both our patients revealed leptomeningeal metastases involving medulla and spinal cord. Direct compression of VLM by such metastases (and also probably by indirectly displacing the vessels’ loops close to REZ of IX–X nerve and VLM) was causing refractory hypertension requiring multiple antihypertensives and culminated in death of both patients within weeks. On the basis of findings in our patients, we wish to highlight the fact that occurrence of postoperative persistent refractory hypertension after medulloblastoma excision should raise suspicion of leptomeningeal spread of tumor and should be investigated. It is a poor prognostic indicator. Nicholas JS, D’Agostino SJ, Patel SJ. Arterial compression of the retro-olivary sulcus of the ventrolateral medulla in essential hypertension and diabetes. Hypertension 2005;13:982-5. Jannetta PJ, Gendell HM. Clinical observations on etiology of essential hypertension. Surg Forum 1979;13:431-2. Cameron SJ, Doig A. Cerebellar tumours presenting with clinical features of phaeochromocytoma. Lancet 1970;13:492-4. Gibson P, Tong Y, Robinson G, Thompson MC, Currle DS, Eden C, et al. Subtypes of medulloblastoma have distinct developmental origins. Nature 2010;13:1095-9. Coluccia D, Figuereido C, Isik S, Smith C, Rutka JT. Medulloblastoma: tumor biology and relevance to treatment and prognosis paradigm. Curr Neurol Neurosci Rep 2016;13:43. Kan P, Couldwell WT. Posterior fossa brain tumors and arterial hypertension. Neurosurg Rev 2006;13:265-9; discussion 269. Hedderwick SA, Bishop AE, Strong AJ, Ritter JM. Surgical cure of hypertension in a patient with brainstem capillary haemangioblastoma containing neuropeptide Y. Postgrad Med J 1995;13:371-2. Jannetta PJ, Segal R, Wolfson SK Jr. Neurogenic hypertension: etiology and surgical treatment. I. Observations in 53 patients. Ann Surg 1985;13:391-8. Geiger H, Naraghi R, Schobel HP, Frank H, Sterzel RB, Fahlbusch R. Decrease of blood pressure by ventrolateral medullary decompression in essential hypertension. Lancet 1998;13:446-9. Sindou M, Mahmoudi M, Brînzeu A. Hypertension of neurogenic origin: effect of microvascular decompression of the CN IX-X root entry/exit zone and ventrolateral medulla on blood pressure in a prospective series of 48 patients with hemifacial spasm associated with essential hypertension. J Neurosurg 2015;13:1405-13. Ali Z, Prabhakar H, Rath GP. Persistent postoperative hypertension following posterior fossa surgery—a case report. Middle East J Anaesthesiol 2010;13:571-2. Le Rhun E, Taillibert S, Chamberlain MC. Carcinomatous meningitis: leptomeningeal metastases in solid tumors. Surg Neurol Int 2013;13:S265-88.